Thank you for having visited my blog in the past year. Looking forward to having you this year, too. In the past year, many of you visited my blog at the time around when the big natural disaster hit Japan in last March. My blog had highest access count then. And at the end of the year 2011, the snowman haiga series attracted many visiters again, and renewed the highest count. Thank you all, and may this year be filled with more good things than not so good things. I wish to offer to you 2 links for wishing you and all your loved ones, plus also all the readers & commentators of your blog, (even if you don't necessarily have to actually love all of them ! 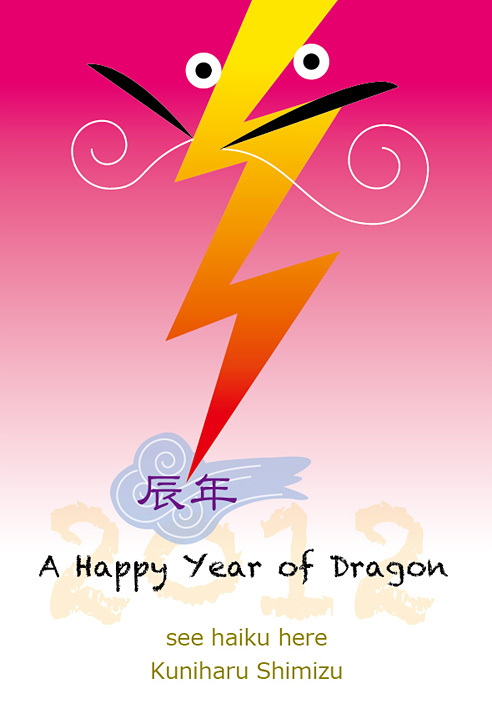 ), a happy, peaceful, constructive, and prosperous New Year 2012, as I am almost quite sure that only the Water Dragon can bring only once every 60 years to most, if not quite all ! A 2012 Happy New Year greeting from a japanese company maverick co ltd to its clients & friends, which I thought was really cool, and I really hope all of you can actually pick and choose which of the greetings in this clip you most wish to be applicable to you for fulfillment in 2012, and even beyond ! Healthy, happy, sunny and calm 2012! Many thanks for such an enjoyable site. Thank you for your comments, links, and haiku.